So, today is Pi(e) day! 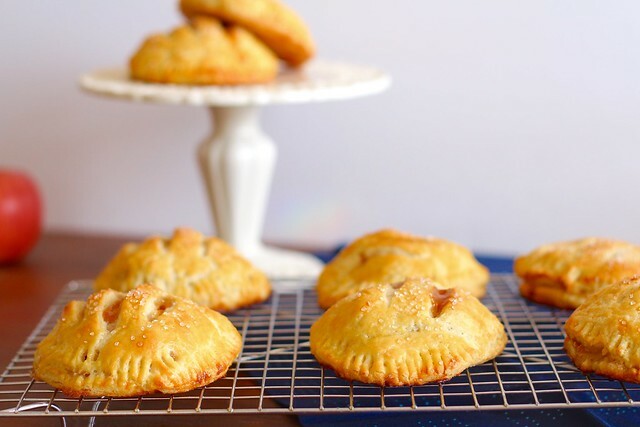 Obviously it is fitting to share a pie recipe with you. 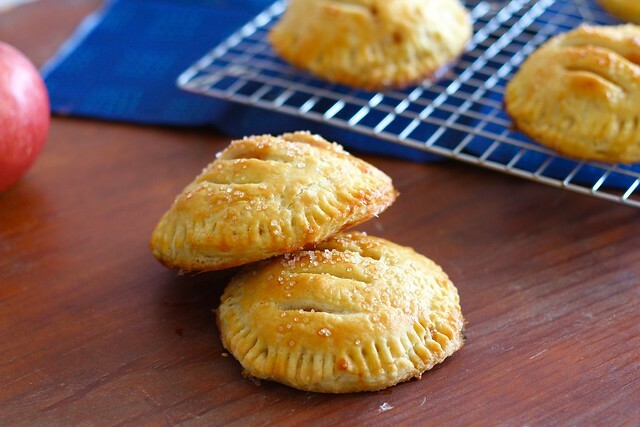 I have only ever made hand pies once before, I think. I don't understand why I don't make them more often! They are so cute and make the perfect individual dessert. They look more complicated to make than they really are. It's as simple as making a crust, throwing together a filling, spooning into the center, then topping with another piece of crust and sealing with a fork. Voilá! The filling possibilities are endless. I definitely need to get onto the hand pie band wagon! This crust is particularly flaky with the perfect amount of crunch. Don't let the sour cream throw you off, you don't even taste it! It just makes it perfectly moist. 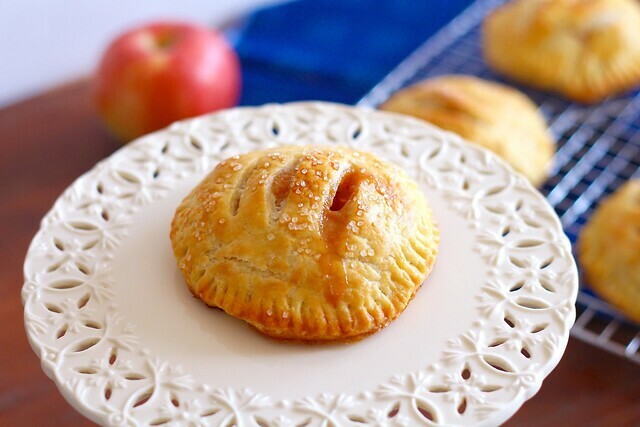 The apple filling is lightly sweetened and flavored with cinnamon. To make it easy, I used store-bought caramels. Although, I think the addition of homemade caramels instead would knock your socks off. If you aren't into the sweet and salty thing, then just omit the salt! 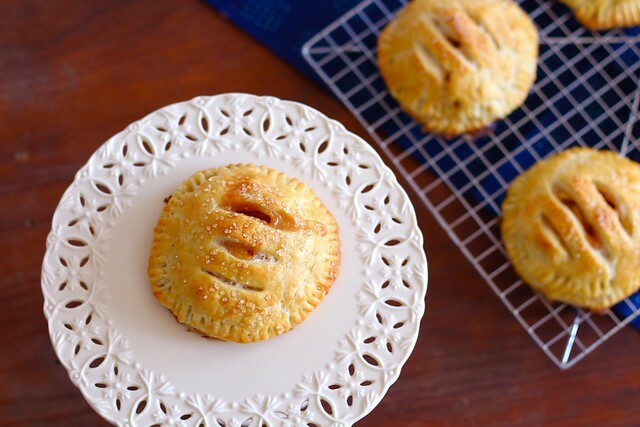 As you can tell by my excess use of the word 'perfect', that these hand pies are really worth the effort. If you don't want to make them all for yourself, just halve the recipe. Or, these would also look beautiful on an Easter brunch table. (Is Easter really that close!?) Anyway or anywhere you have it, just make them! To make the dough, whisk together the flour, salt and baking powder in a large bowl. Cut in the cubed butter with a pastry cutter, or two knives, until there are no butter pieces larger than a pea. (You may have to use your fingers at the end.) Stir in 1/2 cup of the sour cream with a wooden spoon. Gently knead with your hands in the bowl a few times, and if the flour is not fully incorporated, add more sour cream, 1 tablespoon at a time, until everything is hydrated. Place the dough on a well floured surface. Knead a few times until it comes together. If the dough is too sticky, add a little more flour. Roll the dough into an 8x10-inch rectangle. Fold it into thirds like a business letter. Rotate 90º and roll into an 8x10-inch rectangle again. Fold into thirds one more time, then wrap well in plastic wrap. Place in the refrigerator and chill for at least 30 minutes. While the dough is chilling, preheat the oven to 425ºF. Have ready 1-2 parchment or silpat lined baking sheets. In a small bowl, combine the apples, lemon juice, cinnamon, sugar and flour. Stir until completely combined. Set aside. Remove the chilled dough from the refrigerator and unfold it onto a well-floured surface. Roll it out to a 14x14-inch square. 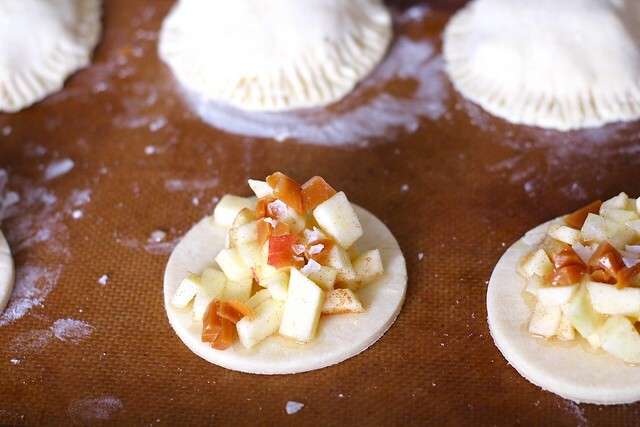 Using a 3-inch circular cookie cutter, cut out as many circles as possible. Re-roll the scraps and continue cutting out circles until the dough is gone. Make sure you have an even amount of circles. 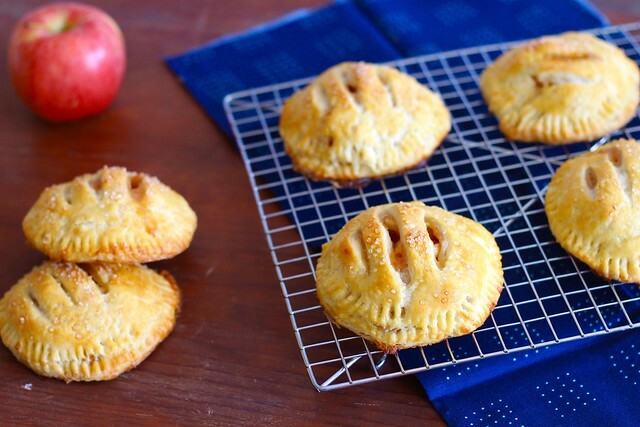 Brush the egg wash over each pie, then cut 3 slits on the top of each pie for steam ventilation. Sprinkle the tops with sanding sugar (if using). Place in the oven and bake for 15-20 minutes, until the pies are golden. Remove from the oven and let chill for at least 15 minutes before serving. Refrigerate any left overs.